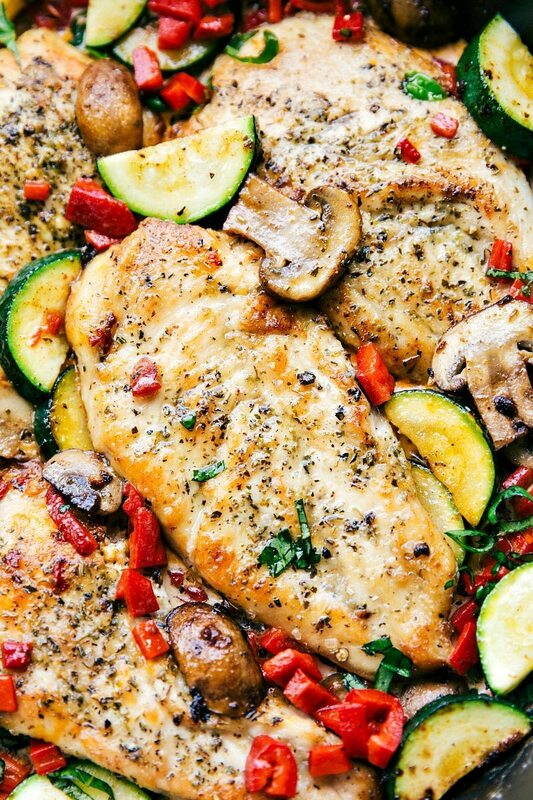 Easy Italian Chicken and Veggies is a delicious meal the whole family will love! This restaurant quality dish is one you’ll want to make over & over again! Just about every Sunday, the boys and I make a treat together — usually cookies, but sometimes we’re making mini molten lava cakes, or some kind of fun twist on brownies (our favorite here). A couple of Sunday ago, I preheated the oven for maybe the 3rd time since moving in. We’d already made the cookie dough that was chilling in the fridge so I went to do other things and then started to smell something funny. New oven smell? Not quite. I opened the oven to find a collection of the toddler’s stuffed animals smoking and charred. Apparently, the toddler had thought it would be a good idea to unpack his very favorite stuffed animals into the oven that I hadn’t checked, because I’m a great mom and my boys definitely understand the oven is no toy. ? Except apparently not. But he’s convinced his mom (yes, me, the person that can’t sew in a straight line on a sewing machine to save my life let alone thread a needle) can somehow magically fix these animals. So, I may not be able to sew, but I will tell you I’m verrrry skilled at re-ordering those very animals from Amazon. And, just asking for a friend now, would it be bad if we pretend they are still the same animals? ? Sooooo we decided to avoid the oven for our Sunday dinner and I whipped up this dish all on the range-top. No stuffed animals were harmed in the making of this one. ?? 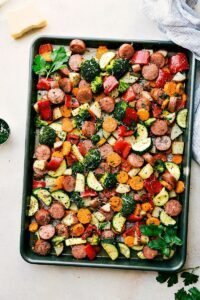 This dish is a little more time intensive than some of the other skillet meals on my site and it does require two skillets. While you can make this all in one skillet, it just doesn’t really make sense time-wise. The dish would take 10-15 minutes longer if you only use one skillet. While it’s a little more involved, I can promise you it is well worth the effort! It is mega flavorful and such a crowd-pleaser — truly a restaurant quality meal! 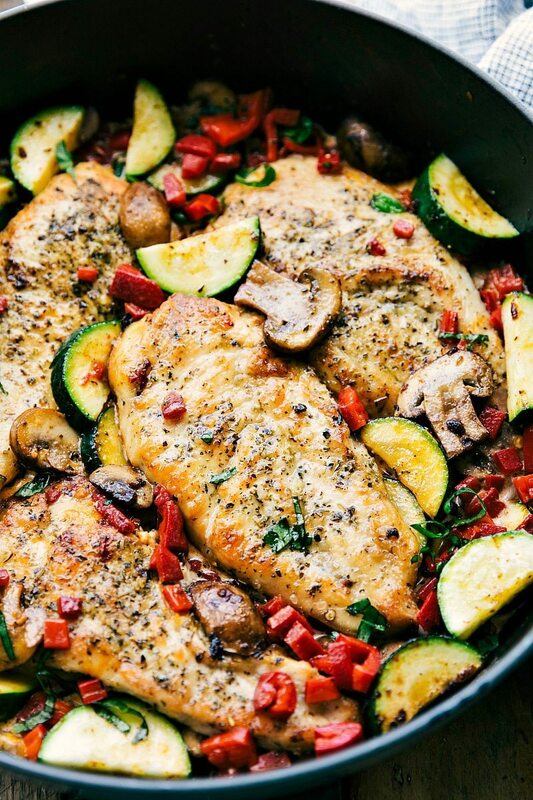 Easy Italian Chicken and Veggies is a delicious meal the whole family will love! This restaurant quality dish is one you'll want to make over & over again! Start by prepping the veggies: half the zucchini lengthwise and then slice into half-moons. Slice the mushrooms. Dice the roasted bell peppers. Next, prep the chicken breasts: Remove excess fat and cut the large breasts evenly in half widthwise to get 4 thin breasts. Pound the breasts to make sure they are completely even thickness. Generously salt and pepper both sides of the breasts. Sprinkle 1 teaspoon Italian seasoning evenly among the breasts and rub into the breasts. Take each piece of chicken and dredge in the 1/3 cup of flour until completely coated. Set aside for a couple minutes to allow the chicken to come to room temperature. Meanwhile, in a large nonstick skillet over low heat, melt 2 tablespoons butter. Add in the minced garlic and stir until fragrant, about 30 seconds. Add in the chicken broth and increase the heat to medium. Bring to a boil. Reduce the heat and simmer (uncovered) for about 5 minutes. Add in the heavy cream and 1 teaspoon Italian seasoning and bring to a boil while stirring. Simmer over medium heat until the sauce is just thick enough to coat the back of a wooden spoon. While the sauce is simmering, grab another large skillet and place over medium high heat. Add in the oil and allow to heat until shimmering. 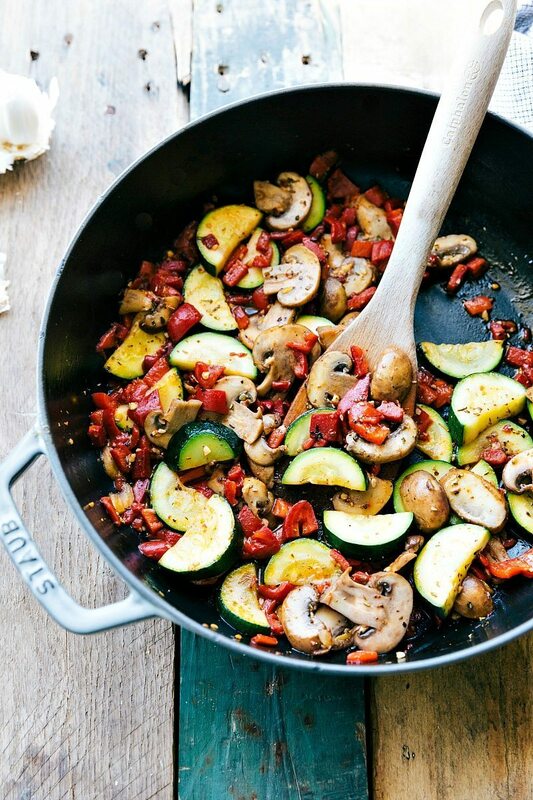 Add in the chopped zucchini and sliced mushrooms. Cook, stirring occasionally until crisp tender. Add in the chopped roasted red bell pepper and last remaining teaspoon of Italian seasoning. Stir and then transfer to a plate. In the same saucepan used to cook the veggies, add in the remaining 2 tablespoons butter. 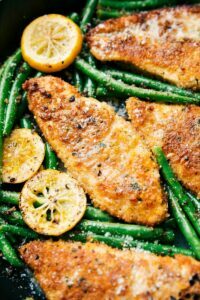 Once the butter is melted, add the prepared chicken breasts into the skillet. 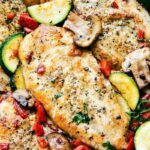 Cook over medium heat for about 3-4 minutes per side or until the chicken reaches an internal temperature of 165 degrees F.
Add the veggies and sauce in with the chicken and season additionally to taste with salt and pepper. Add in the fresh chopped basil. If desired serve over cooked pasta with a generous sprinkle of Parmesan cheese. This looks amazing! I cannot wait to try it! As a mom of five, I could totally relate to having toys in the oven. Oh no! 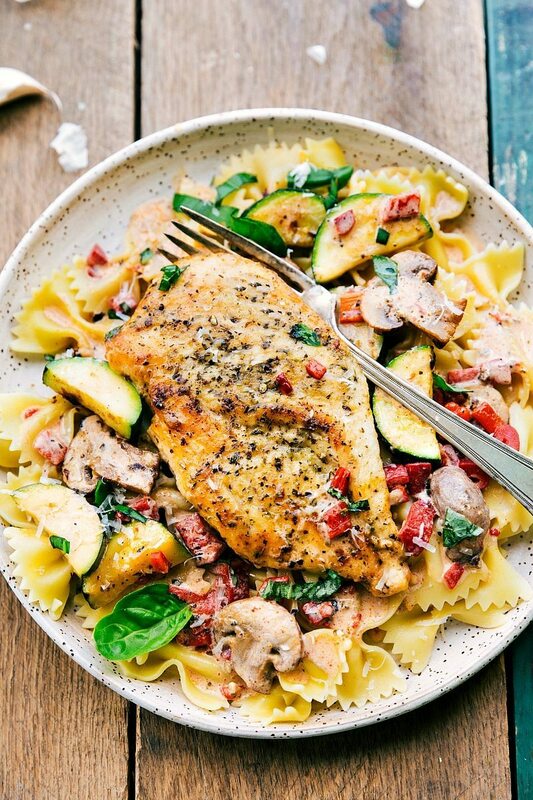 This dish looks amazing and I hope to try it soon. 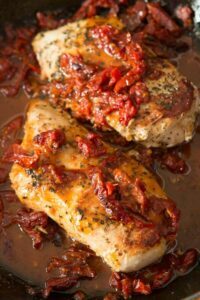 I haven’t used jarred roasted red peppers, and know they would really add great flavor. hey girl- this looks so yummy! And kids will be kids huh? funny story! And this chicken looks delicious! 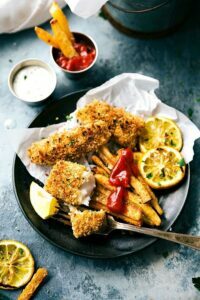 Wow, I love to explore my favorite chicken recipes every time through blogs and videos, thanks for sharing this with us.I gonna add this to my food list. 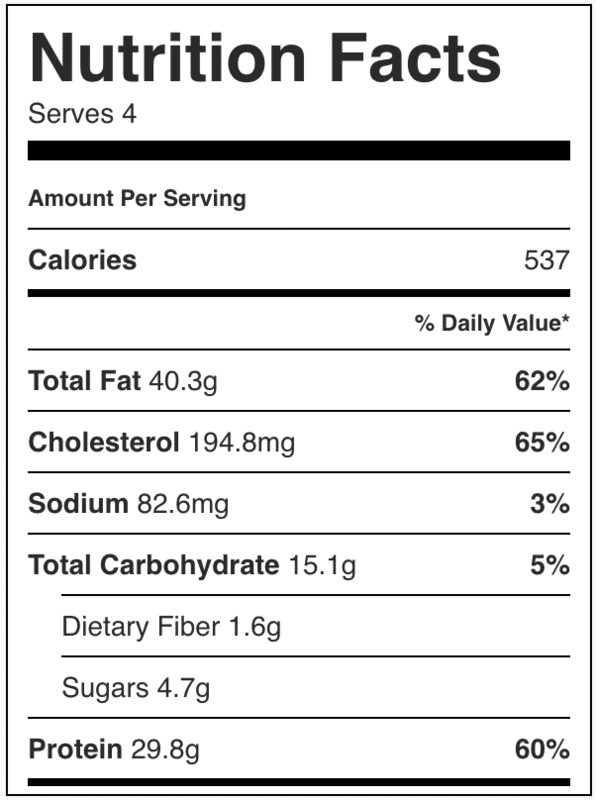 Why does this recipe have so much cholesterol and fat? Because we are cutting out the fat from the chicken..
Do you think something else can be substituted for the heavy cream? My husband is sensitive to dairy, but this looks so good! Maybe almond milk? Coconut? Unfortunately other milks (especially nut based) won’t thicken up and I believe coconut milk would give it a funny taste. I think your best best is to make this just without the cream. Sorry to not be of more help.